Panjab: The Hazari Bagh, Lahore. bl.uk > Online Gallery Home	> Online exhibitions	> Asia, Pacific and Africa Collections	> Panjab: The Hazari Bagh, Lahore. 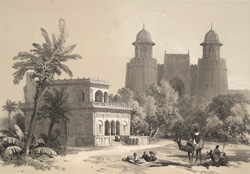 Plate 11 from "Recollections of India. Part 1. British India and the Punjab" by James Duffield Harding (1797-1863) after Charles Stewart Hardinge (1822-1894), the eldest son of the first Viscount Hardinge, the Governor General. Charles Hardinge recalled his impressions of the city: 'Those who were acquainted with Lahore in those days can alone form an idea of its picturesque aspect. Surrounded by the ruined tombs of the Muhammadan kings, the city with its fortifications, its colossal pillars and minarets, presented an appearance which made it rank among the most striking of our Eastern towns, Amritsar alone excepted.' The Hazuri Bagh gateway is seen here from inside the courtyard adjoining the Lahore fort. In the garden is a small marble pavilion known as the Baradari of Ranjit Singh.